“Then I knew I was alone — inside this pulsing glowing cathedral. The shifts had meaning! The structure was elegant, labyrinthine yet organic. The colours altered seeming at will. As I breathed, I breathed; as it breathed, I breathed. Could it be my will? I was somehow affecting this structure and it, affecting me!” Forsythe, Kathleen. "Cathedrals in the Mind: The Architecture of Metaphor in Understanding Learning," in "Cybernetics and Systems ’86," Robert Trappl, editor. D. Reidel Publishing Company, 1986. 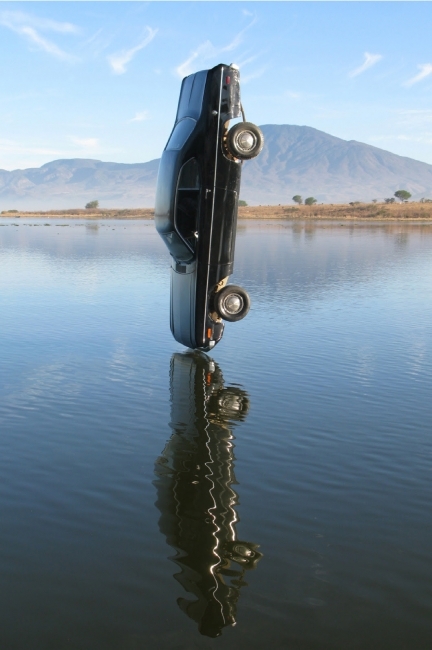 P. 286 For "Cathedral," artist Gonzalo Lebrija presents a new body of work in dialogue with past projects, offering the visitor a generous range of his projects from 2003 to the present. Through his multifaceted artistic practice, Lebrija has explored a range of existential subjects like time, death and perception, among others. Often addressing the rise of industrial capitalism and its consequences, Lebrija´s projects materialize in many mediums like film, sculpture, installation, drawing, painting and photography, making his artistic practice flexible and unexpected. The exhibition title summons the architectural format of the cathedral — not for its religious connotations but for its potential as metaphor — focusing on the capacity of formal elements of architecture like scale, light and space, and their relationship with experiences with the sublime or aesthetic dimensions. Lebrija’s most recent series that’s part of this exhibition is titled "Veladuras nocturnas [Night Glazings]", and features a collection of large-scale paintings depicting geometric patterns over a dark background. In the way that the old masters used progressive glazes of color to achieve form and depth, Lebrija utilizes the same method but with iridescent paint to create a dynamic experience. The overlapping areas create subtle light registers in which the movement of the viewer directly affects them, creating a commentary on the refraction of light and its perception — an ongoing interest of the artist. Other projects, playfully, even ironically, explore notions that are seemingly too large to grasp. One of the exhibition’s most notable installations "The Eternal Flame" consists of a room with a single plinth where a replica of a common, cheap lighter, is the source of a minuscule flame, that remains lit for the duration of the show. The spaces created by the architecture of the exhibition in dialogue with the presented constellation of artworks has been conceived to provoke a particular state of contemplation. This can be trailed as a reference to the "Arquitectura emocional" or Emotional Architecture. A term famously discussed by Pritzker Architecture Prize winner Luis Barragán, as an experiential notion of space where the intentional use of architectural elements sparked emotions and aesthetic experiences. Aside from being a source of inspiration for Lebrija, Barragán’s views of space, light and color both emerge from and actively respond to the conception of spaces of adoration. Transported into a secular space, the exhibition "Cathedral" offers both a reading of an artist’s career, as well as a deconstructive gaze into a widespread architectural format. Lebrija has exhibited extensively in Latin America, the U.S. and Europe. Some of his individual exhibitions include "Vía Láctea," Museo Rufino Tamayo, Mexico City and Palacio de Bellas Artes, Havana, Cuba; "Mariachi Wagner," Moody Performance Hall, Dallas, Texas; "Caída Libre," Galerie Laurent Godin, Paris, France; "Unfolded Paintings," Travesía Cuatro, Guadalajara, Mexico; "Unfolded," Galerie Laurent Godin, Paris; and Museo de Arte de Zapopan, Guadalajara; "Who knows where the time goes" Faggionato, London; "Possibility of Disaster," Centro de las Artes de Monterrey, Mexico; "R75/Toaster," Multimedia Art Museum, Moscow, Russia and Galerie Laurent Godin, Paris; "Trou noir" Galerie Laurent Godin, Paris; "Deriva Especular," Museo de Arte Moderno, Mexico City; "The Distance Between You and Me," I-20 Gallery, New York, New York. Cathedral is curated by Humberto Moro, SCAD curator of exhibitions. This exhibition is part of SCAD deFINE ART 2019, held Feb. 26–28 at university locations in Atlanta and Savannah, Georgia.